Not all newsrooms are dying off. Along Madison Avenue, the concept of the brand newsroom has ascended to the center of many social marketing strategies. And now it’s won Mondelez’s Oreo brand and agencies 360i and Draftfcb a Blue Award, the top honor in Facebook’s second annual Studio Awards. “The Blue Award is a way of showing a piece of work independent of whether it was just good. Did it tip the direction in what they’re doing?” said Mark D’Arcy, director of global creative solutions at Facebook. 360i and Draftfcb drew much attention on Facebook (more than 1.3 million likes, comments and shares) and in the press (more than 2,600 articles) for the hundred-day “Oreo Daily Twist” campaign that began with posted image of a rainbow Oreo to celebrate gay pride and ended with a live campaign production conducted for all Times Square to see. And for all the industry to see what a brand newsroom looks like. 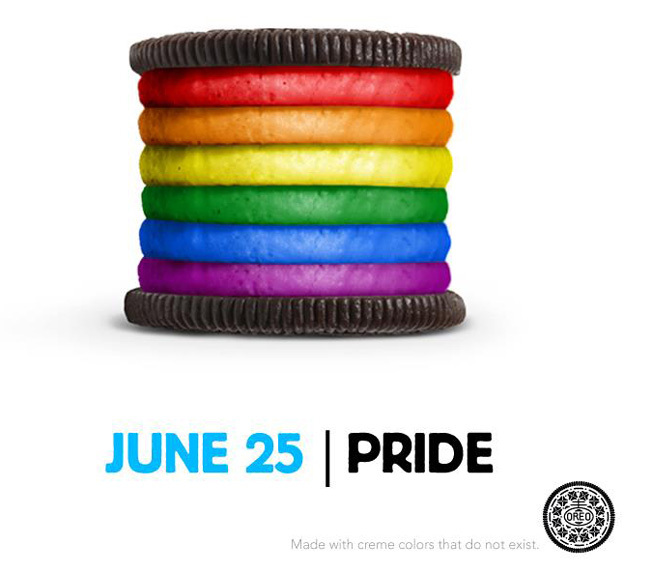 Fellow judge Rob Feakins, chief creative officer and president at Publicis Kaplan Thaler, credited the Oreo/360i/Draftfcb newsroom for the brand’s ability to notch more than 60,000 shares. “Yeah, it’s a brilliant piece of creative and [gay rights] was a hot topic during that time. But it’s a cookie. That’s cultural timing meets really smart creative,” he said. However being able to time creative to culture is tricky. Brands like Kenneth Cole have been burned by wading into too-hot waters, and many marketers must navigate labyrinths of legal approval before publishing to their social channels. “You can’t have a conversation [with your social community] if you have to go through legal approval every time you talk to them,” said 360i president Sarah Hofstetter, whose team sat down with Oreo and Draftfcb before the campaign to hash out guidelines. “A combination of agency partners, brand stakeholders and legal agreed on a couple different directions to develop the image and copy,” she said. “Our metaphor was operating like a newsroom, having qualities like a media company by constantly publishing, looking for different angles, holding edit meetings,” said Hofstetter, a former New York Times Company employee. Oreo’s campaign signals a larger trend apparent among the 37 Studio Awards finalists of brands’ Facebook strategies pivoting toward publishing. “Very clearly the trend from last year was from people doing one-off apps to use social technology to do something cool to now how to use that to create a story that deepens,” D’Arcy said. While Facebook’s Creative Council members appraised campaigns according to criteria such as what aspects of the Facebook platform it incorporated and how deeply, did it scale and how did it drive business metrics (which D’Arcy called “arguably the most important” criterion), they were looking for something less clearly defined and in keeping with Facebook’s wishes for brands to function as friends on its platform. Assuming Facebook runs the Studio Awards next year—D’Arcy suggested it will—more recognition may be doled out. D’Arcy is considering the possibility of awarding campaigns in specific categories such as media strategy, targeting and in-store promotions. “People are using the platform in so many different ways. We want to make sure we’re celebrating the right things in the right way,” he said.